Can Aquariums in Branson and Springfield Both Be Successful? Yes! Since Kuvera Partners announced its plans for the proposed Aquarium at the Boardwalk, there have been some questions about a potential conflict with Wonders of Wildlife in Springfield. Seaquest in Littleton, CO and Downtown Aquarium in Denver, CO are 14 miles apart. OdySea Aquarium in Scottsdale, AZ and Sea Life Arizona Aquarium in Tempe, AZ are 16 miles apart. Atlantic City Aquarium in Atlantic City, NJ and Seaport Aquarium in Wildwood, NJ are 43 miles apart. Downtown Aquarium in Houston, TX; Aquarium Pyramid at Moody Gardens in Galveston, TX; and Sea Center Texas in Lake Jackson, TX are all within 54 miles of each other. In addition to visiting aquariums throughout the United States, Kuvera Partners commissioned H2R Market Research to learn how visitors would react to having an aquarium in Branson. The study was conducted in July 2018 – with W.O.W. already open and well-publicized. H2R concluded that Aquarium at the Boardwalk is considered appealing and noteworthy. “After reviewing the Aquarium images and description, nearly nine in ten (86%) like the idea, significantly higher than H2R’s Proprietary Industry Norm,” according to CEO Jerry Henry. “Likewise, eight in ten revealed the Aquarium would generate market buzz, causing them to talk about it with friends, a figure that is also significantly higher than H2R’s Norm,” he says. Additionally, the study showed a large increase in the number of people who said they would be likely to come to Branson if Aquarium at the Boardwalk was available. 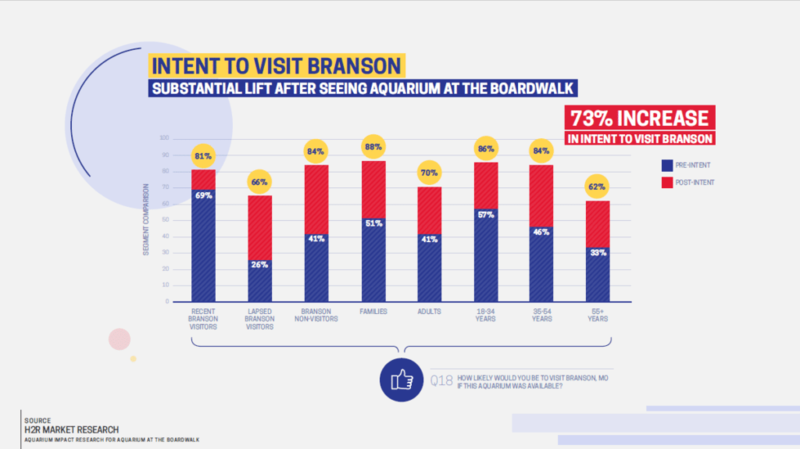 The Aquarium ranked highest as an attractor for people who have never been to Branson before (Non-Visitors) and people who have not returned to Branson for at least two years (Lapsed Visitors). If Tax Increment Financing (TIF) is approved by the City of Branson, the proposed Aquarium at the Boardwalk could open at the corner of Glory Road and Highway 76 on the Grand Palace property in March 2020. Updates will continue to be available here at www.AquariumAtTheBoardwalk.com.